Like Bill, Ginger also went to Westminster College, and met her future husband John Giovale at the college. Even one of John and Ginger’s sons went to Westminster, where he also met his future wife at the college – talk about a family tradition! Ginger served on the Board of Trustees for 29 years, and served as President of the Board for 18 of those years. The generosity of Bill and Vieve, and Ginger and John, is stamped all over the campus. Not only is there the Bill and Vieve Gore School of Business, there is the Vieve Gore Concert Hall in the performing arts building. There is the Giovale Library. There is the Giovale e-Portfolio Center for students to create online portfolios to demonstrate their mastery of the college-wide learning goals. There are the sizable contributions from the Giovales to the Meldrum Science Center. Perhaps even more important than the direct impact of the generosity of Vieve Gore and Ginger and John Giovale was the indirect impact of their dramatic statement: “We believe in the potential of this place!” As a result, many other donors from the greater Salt Lake Valley made significant gifts of money and buildings, giving the campus a “finished” feel, vibrant and relaxed. The celebration of the Bill and Vieve Gore School of Business was a two-day affair, including a faculty breakfast with our guests of honor—Ginger Giovale and Terri Kelly, the CEO of W. L. Gore & Associates, a noontime ceremony with speeches and a reading of a proclamation from the governor declaring September 19, 2013 as the Bill and Vieve Gore School of Business Day in Utah, and an afternoon poster session showcasing twenty entrepreneurial ventures started by recent alumni of the School and College. The entrepreneurial energy so prized by Bill and Vieve as palpable. 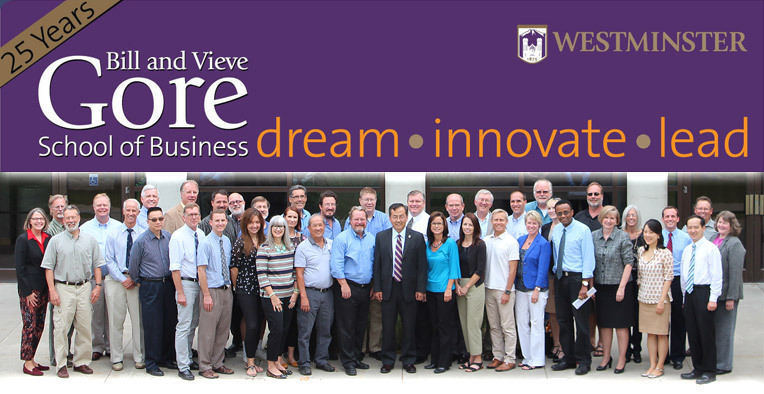 Although there is no official tie between the Gore School of Business and the W. L. Gore Enterprise, the School endeavors to extend the legacy of thinking of the Enterprise founders, and Associates from Gore are often welcomed visitors on campus to share insights into how Bill and Vieve’s vision of organization is being actualized at the Gore company. Terri Kelly was such a guest for this occasion, and the day ended with her very insightful and thought-provoking keynote address on the Gore culture as a strategic competitive advantage. Over the years as an Associate at Gore, I had worked with Terri on numerous occasions on matters of culture. In the early 2000s, when Chuck Carroll was CEO of the Enterprise, we worked together as part of a project team of leaders to find ways of re-articulating the Gore culture in ways that manifested a commitment to the core values and principles, but also displayed the culture’s capacity to adapt to changes going on in the outside world. Some years later, soon after Terri became CEO, I had the opportunity to facilitate a 3-day intensive session in Berlin with Terri and 8 or 9 European leaders as we grappled with the question of what, exactly, was the linkage between the Gore culture and business effectiveness and business results. That began a fairly extensive (and on-going) effort to understand and articulate how the Gore culture creates a strategic competitive advantage. Terri’s talk was a demonstration of how far Gore has come in its ability to articulate the relationship between its culture and its performance. The ability to do so means that the deeper import of the culture can be shared with new Associates, and those Associates who take on leadership commitments. So, instead of just a chart of the culture in each conference room with important Gore “words” on it (and there is such a poster in nearly every conference room at Gore! ), Associates have a more thorough understanding of the interwoven relationships of their iconic terms and practices, and how they all work together synergistically to create business value. Those who attended Terri’s talk were inspired, and challenged by the realization of how much “work” it takes to actually get an understanding of one’s culture that is more than a mere repetition of some well-crafted ideals and phrases. On the second day of our celebration, after an impressive presentation of Westminster College alumni who have made major contributions to our free-market society, either through their efforts within the organizations they work for, or through the ventures they have founded and brought to success, I led a workshop session to explore the question raised by Terri’s talk and the accomplishments of our alums: can the culture of the Bill and Vieve Gore School of Business be used as a competitive advantage? In the workshop, I intended to try out an approach I had developed in my work as a consultant with Gore and had used for various strategic initiatives—Team Tools for Wicked Problems. There was some reasonable skepticism about getting faculty to devote four hours on a Friday afternoon for an undefined process. At Gore, when we would take on a new project, we would try to identify early on what was our “greatest uncertainty.” There is a tendency, and certainly in new product development efforts, for people to work “in their comfort zone,” rather than in the area of greatest uncertainty. So engineers can energetically get very far down the path of working the technical challenges of designing a particular product, when the greatest uncertainty is whether there is a market for it even if all the technical challenges were resolved. When a project is at its start (as we were with exploring whether the School’s culture could be a strategic competitive advantage), it’s often the case that the greatest uncertainty comes about because “we don’t know what we don’t know.” Each person may have an individual view of what we should do, but there is no collective sense because we don’t have a collective understanding of the landscape of what we’re working with—what we know and don’t know about the domain we’re exploring. One of the basic premises of the “team tools for wicked problems” approach is that, with appropriate design and facilitation, you can and need to tap into the “wisdom of the crowd.” You don’t need to limit the invite list! As my OD friends would advise, “Get the whole system in the room.” So we had about 70 participants in all, a mix of faculty, staff, students, alumni, Dean, Provost, President, and a number of current and former Associates from W. L. Gore & Associates. Over lunch, I described our workshop flow to be an iteration between processes of divergence and convergence. Rather than provide an agenda, I tried to create an image of what we would do by saying our journey would be less like geese flying in formation, and more like swallows swooping this way and that, sometimes splitting and then re-converging and despite the apparent disorder, they end up flying as a flock. Not everyone attending was a member of the Gore School of Business. So we had some guided dialogue to lay a common though rough sense of the School’s culture. We then created a collective landscape of the dimensionalities of the challenge of “using the Bill and Vieve Gore School of Business culture as a competitive advantage.” Then each participant generated questions they felt were most important for us to answer NOW. Through discussion at tables and then through some technology-aided voting, we winnowed the list of 140 questions to the top 8 we wanted to really focus on. (The technology is a nifty “clicker” system where each participant gets a clicker with a keypad and can key in their response to any question posed, with an immediate tally and display of the “votes” in the room.) Participants “voted with their feet” and moved to the tables where the question that most interested them was to be discussed. Each table did a report back on their conclusion. Then, we voted as an assembly, using the clickers, to determine how much we collectively agreed (or not) with the presented conclusion. From there, we returned to our original tables. Each table had the task of generating the action plan they felt represented “What We Should Do.” Again, we voted on each of the tables’ proposed action step in terms of how disposed toward them we were (or not). There were some surprises. Sometimes there was a strong trend toward consensus, and sometimes not. The power of the voting technology—which gives a very precise rather than impressionistic sense of where the room stood on various issues—created confidence about what the next steps for the group really needed to be. The result was a very productive afternoon conducted in a manner compatible with the legacy of Bill and Vieve Gore that demonstrated a strong feeling from the participants that further work on exploring the potential of culture as a competitive advantage for the Bill and Vieve Gore School of Business was warranted. How do I know? That conclusion was affirmed by a final vote with the clickers!